I was born in South Central LA to a family of limited resources. But from a young age, I knew I wanted more. As an incredibly shy little girl, I rarely used my voice to claim my place in the world; nor was I really encouraged to. I also always loved tennis - although I didn't play the game or even know any one who did. 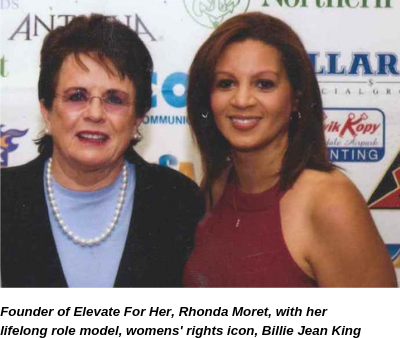 Particularly, I loved Billie Jean King. Not that I was inspired to play like her but I was inspired to be like her. Strong. Outspoken. Confident. On a Sunday morning breakfast run I was shocked to see BJK eating an Egg McMuffin in "my hood's" McDonalds (seriously she was). And although my shyness often held me back, I knew I needed to be bold and ask for her autograph. I asked. She complied and that McDonald's napkins served as a source of inspiration for many years. Fast-forward to today, I truly believe that in order for true gender and pay parity to be secured, ALL women need to learn how to use their voices and claim their value. Our organization's social good component includes partnering with non-profits supporting women from underserved communities to provide training on a gratis basis. The picture of me with BJK is one of life's full circle moments. The public relations firm I had owned at the time was retained to handle the publicity of an event Billie Jean was the keynote. The topic? BJK encouraged the sold-out room of mostly women to be bold, to be empowered, and to use their voices. Preach Ms. King - Preach.